Several midwestern states have suffered some of their worst deluges on record, raising more climate-change fears. That could influence voters in Iowa, where presidential candidates face their first test. And the floods’ financial toll may prompt underwater farmers to dump Trump. A flooded parcel of land along the Platte River is pictured in this aerial photograph at La Platte, south of Omaha, Nebraska, U.S. March 19, 2019. 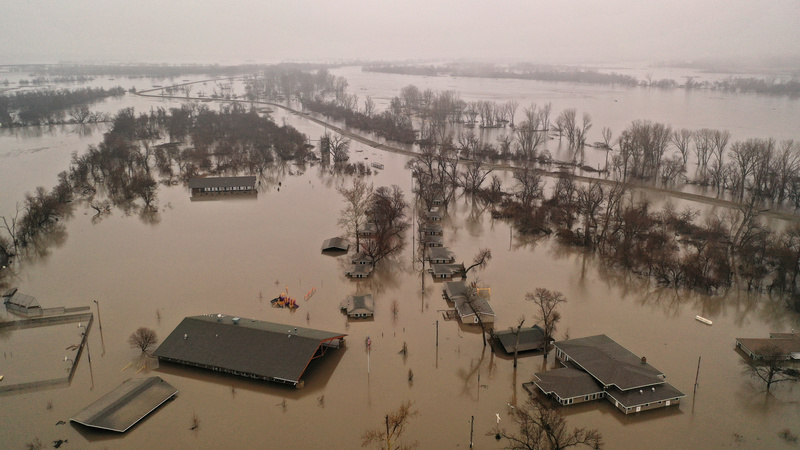 Nebraska Governor Pete Ricketts told CBS News on March 20 that recent floods have caused the most widespread destruction in the state’s history. Flooding has forced thousands of people to flee their homes in the midwestern area of the United States in the past week. Nebraska, Iowa and Missouri are among the affected states. Separately, there were 223 Chapter 12 farm bankruptcy filings in the Midwest in 2018, according to the American Farm Bureau. It reflects a 19 percent increase from 2017 and is the highest number of filings in more than a decade.